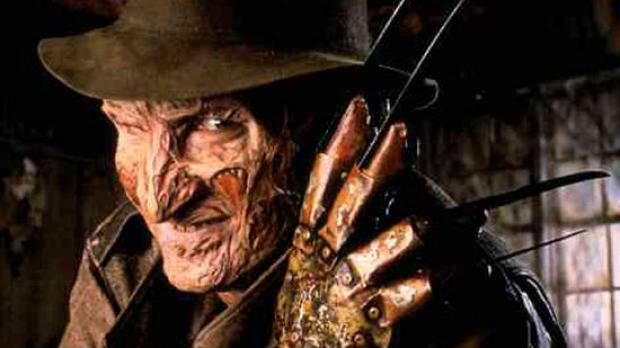 Wes Craven’s Inspiration for Freddy Krueger Was a Homeless Man and Real Events! Movies focusing in part on real events often make up a large part of the movie industry. In fact, it’s often the case that movies based on real events are the best stories. Some great examples are Schindler’s List, Braveheart and Titanic. While some aspects of these stories were altered for entertainment purposes, the movie pretty well stuck to the script of how things really played out. While horror movies aren’t exempt from being based on actual events, you would hardly think that “A Nightmare On Elm Street” would fit such a criteria, but it does. You see, Wes Craven’s inspiration for Freddy Krueger was a disfigured homeless man, his childhood bully, a pop song, Dream Weaver, and a DC superhero. As for the plot of the horror movie, it was based on real events that were reported in the Los Angeles Times. A Nightmare on Elm Street is one of the classic horror movie series. First appearing in the 1980’s, the franchise has not only managed to scare the crap out of people for about three decades, but it also launched the career of one Johnny Depp. That’s right, without this B-grade horror movie franchise, one of the largest names in entertainment may have never got a break. So back onto topic. Let’s take a look the villain first shall we? A monstrous man called Freddy Kreuger. Mention any bad guy from a horror movie and Freddy Kreuger will have to rank among the first to come to mind. Disfigured beyond belief and wielding a glove filled with razor sharp blades, there’s hardly a more terrifying figure that you could come across. Even Jason doesn’t look as scary. But why make him so scary? Surely he had to be based, at least in part, on a real person? Well, Wes Craven’s inspiration for Freddy Kreuger was a real person, an unnamed person at that. 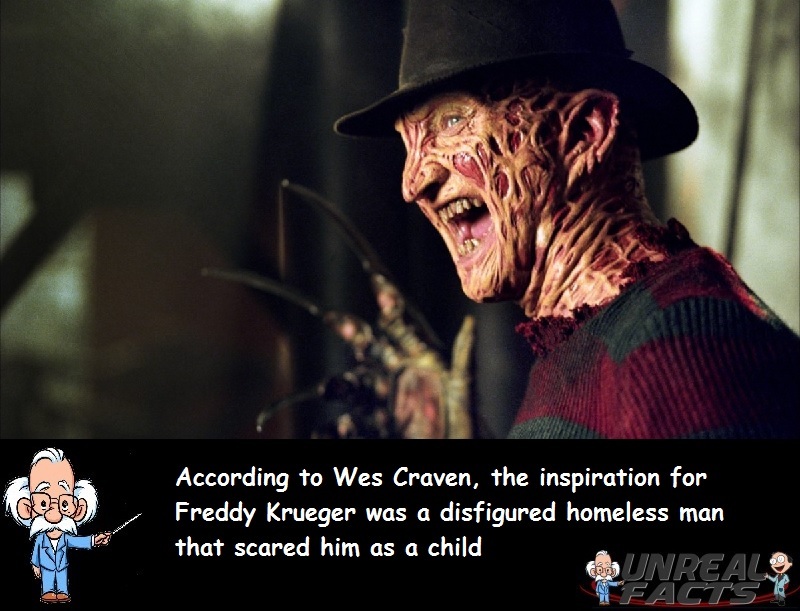 According to Wes Craven, the horrific look of Freddy Kreuger was inspired by a disfigured homeless man that scared the crap out of Craven as a kid. Craven described this poor fellow as being just as terrifying as the monster he brought to life on the big screen. Let’s face it. This one dude was so scary that he stayed with Craven right throughout his adolescence and into adulthood. But this is only part of the persona. A completely disfigured man can certainly be scary, but it’s what’s on the inside that matters the most, or at least that’s what we are told. Craven needed a personality to match the disfigured man. So say hello to his childhood bully, a one Fred Kreuger. I have to admit, this is the ultimate revenge. How many of you that have been bullied as children dreamed of getting back at the bully in some way or the other? For most of us it’s only a dream, and will never be fulfilled. But gee wiz, Craven had the opportunity of a lifetime and used his childhood tormentors name as the name for the evil and disfigured villain. Now that’s a payback that will last decades. The remainder of the persona was based on DC Comics superhero Plasticman. Never heard of him? Probably the reason Craven was bullied as a child. The only part of the character was the outfit. Jason had a mask, and Chucky was a doll, which is kind of scary enough in itself. How to make an already screwed up individual that kills people in their dreams even more scary? Craven opted to give him a red and green striped shirt because those two colors clash the most. This mix of a messed up individual, taken from a disfigured homeless man, a bully, and a superhero formed the horrific man we know today as Freddy Kreuger. But what about the plot and story line? You know, his power to attack and kill people in their dreams, ala lucid dreaming fashion, is a really weird idea, and one that kept a lot of teenagers up late for a very long time. The idea for Freddy Kreuger’s power came from a series of reported events in the LA Times. At the time that Craven was developing his story, a series of unusual deaths were occurring throughout California where people were reporting recurring nightmares. The victims who made the reports all later died in their sleep. Pretty freaking weird, huh? To capitalize on these weird events, Craven had to build a background for his character that would make him absolutely despicable. At first he decided to make him a child molester, but due to a series of child molestations at the time, he decided to make him a child murderer to avoid any bad publicity by exploiting the spate of molestations at the time.